Once again, surfing was on my mind. So, what do you know? I went fishing. And, look what I brought back. I couldn’t help myself; I had to place a few scores on my big boy and made him my own. Well, scoring helps for the penetration of all the amazing spices and seasoning on this adorable specimen. So, I proceeded to season inside/out with salt, black pepper, crushed garlic, crushed pimento(all spice), thyme and finely chopped scotch bonnet pepper. Before I laid my seasoning on, I drizzled a little coconut and olive oils in the interior and exterior of my fish. My plan was to cook in oven at 380 to 400 degrees at high temperature so as to give a roasting effect. Thus, I called upon my parchment paper. For me, parchment paper helps to lock in flavors but will also provide a rustic/roasting process. Before that though, I sautéed onions, bell peppers, and grape tomatoes in a skillet making sure to season along with a pinch of salt and black pepper. 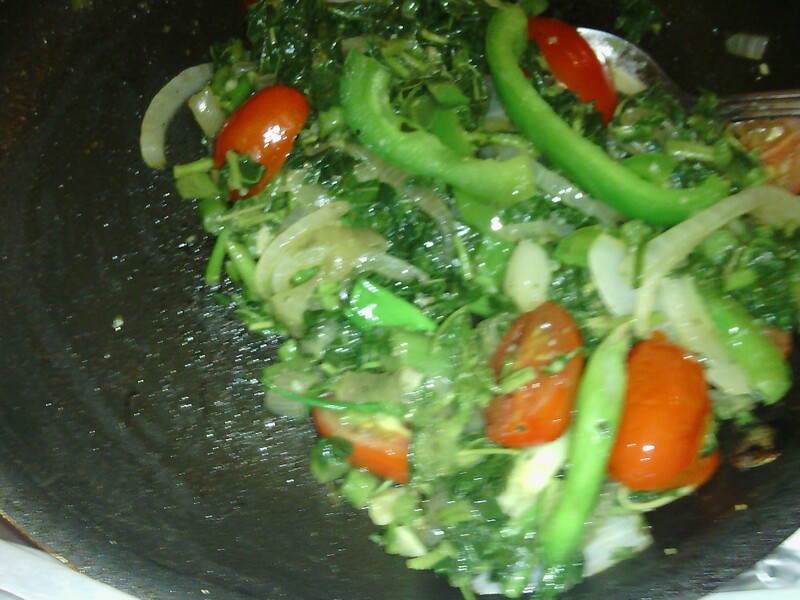 Then I added some steamed left over Jamaican spinach (callaloo). I used same to stuff my snapper. Well, as you can observe, it was an overstuffed affair. Baking sheet was lined with foil paper so as to contain any spillage. Then, a generous piece of parchment paper was used to place fish. I stuffed the head and cavity of same. And boy, it spilled. Already, succulent juices was expelling from within. It smelled amazing. With the squeeze of a little lime and splash of vinegar, I added additional finely chopped scotch bonnet yellow pepper. Then I folded my beautiful parchment package and poked a few holes for some of the steam to escape. 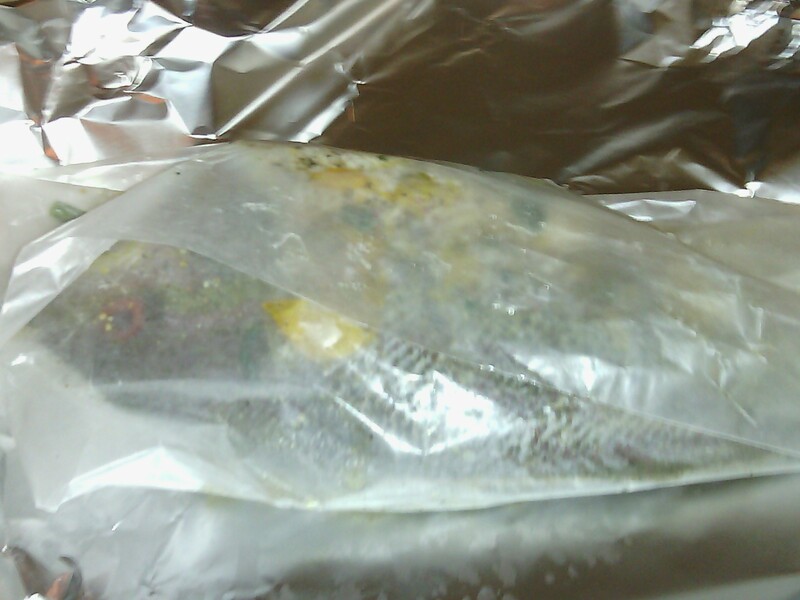 Fish was placed in oven at 380 degrees for approximately 15 minutes. Then, I pared open my parchment package and gave dish an additional five minutes at 400 degrees. At this point, I was super-excited and so was my fire alarm. You see, the parchment paper started to singe a bit. Anyway, that didn’t stop me. I placed snapper back in the oven and look what I got. 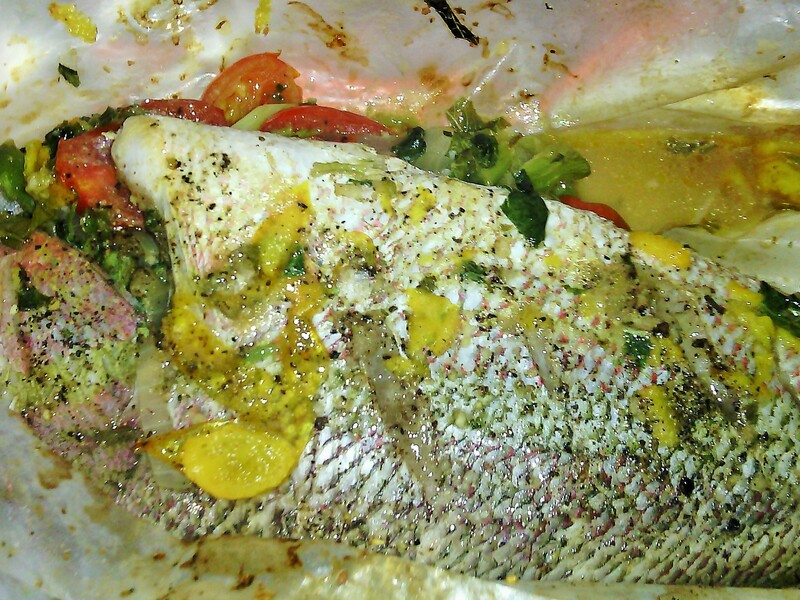 My snapper made and emitted a delicious sauce which came from the veggies(stuffing) within. The fish was cooked just right. It was moist on the interior and slightly flaky on the outer. I served same with fried plantain to balance out the spicy flavors of the scotch bonnet peppers. Hmmm, I was overjoyed with my rustic dish.